Clear, acrylic-polyurethane varnish recommended for indoor use on wooden floors, parquet, stairs, etc. It creates a durable and permanent coating. It enhances and highlights the natural beauty of wood. 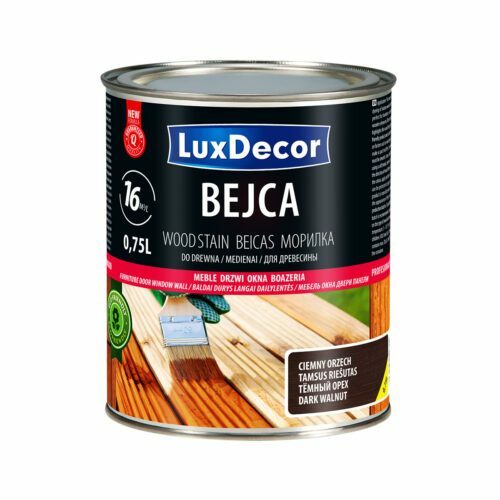 It prevents drying and cracking of wood. 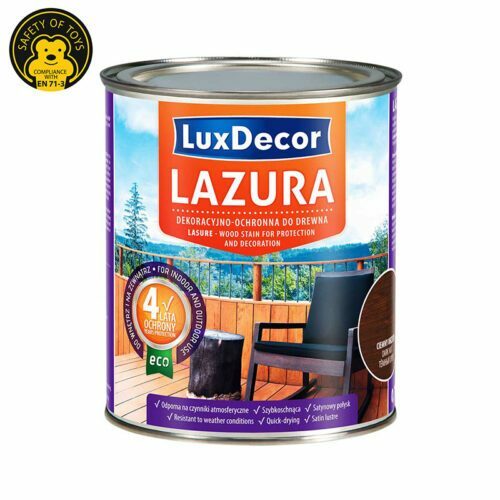 It is also recommended on surfaces already painted with colouring wood stains. Surface preparation: The substrate should be dry and clean, free of dust, grease, wax and other types of dirt. Old surfaces must be sanded with fine abrasive paper and dedusted. The wood moisture content should be max 11%. 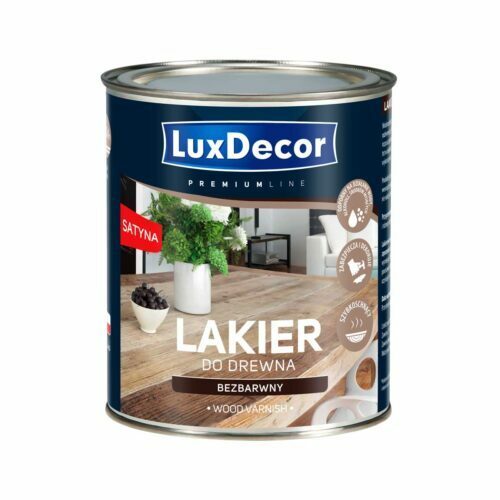 Cracks should be filled using Luxdecor wood filler. Knots can be protected with resin blocking agent and, in order to avoid yellowing of the layer, the substrate must be painted twice using separating primer. 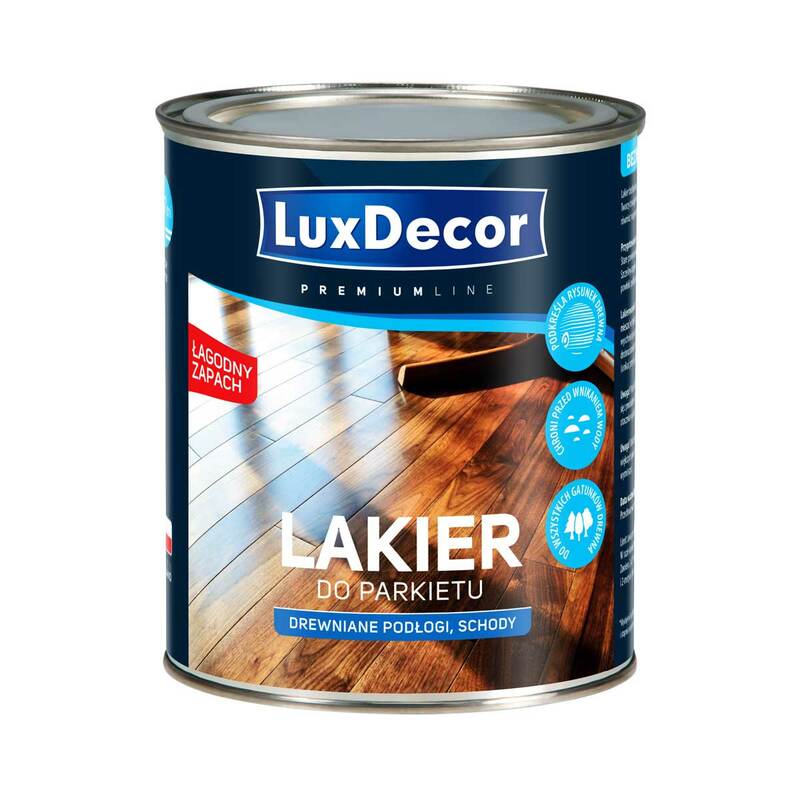 The floor can be painted using Luxdecor water-based stain. Varnishing: The substrate temperature should be within the range of 10°C to 25°C. Mix the varnish thoroughly. The product should be mixed also during application. Apply a thin, even coat along grains. The next coats should be applied after the previous layer has dried. Avoid damp patches. The best effects can be obtained if between layers you perform sanding with fine abrasive paper. After application of each coat the substrate should be protected against water and dust (avoid draught). Note! Before varnishing, it is recommended to make a spot test in an invisible place to become familiar with product application. Drying time of the coat and its final look depends on wood species, quality, moisture content and environmental conditions under which the works are performed. Note. The final effect depends on the degree to which the wood is polished, wood species and manner of application. For bigger surfaces use products from the same production batch or pour different batches to one container and mix them thoroughly. The expiration date is on the package.